Growing up I remember saving my allowances and doing extra chores so I could go the show with my friends and buy the popcorn. I would count the days until Saturday rolled around because half the fun was the anticipation. It seems to me that we do not look forward to things like we used to. The age of credit cards has made it so much easier to get what we want when we want it. Those things that were so appreciated because we worked and saved for them have now become an everyday occurrence. While getting what you want is fun and gratifying, what’s missing today is the waiting, preparing, planning and anticipation followed by magical moment when it all comes to fruition. Nothing outshines the anticipation of travel. Psychologists have known for some time now that anticipation provides both physical and mental health benefits the minute you decided to travel. Purchasing travel experiences provides longer lasting benefits than purchasing goods or services. Anticipation begins in the planning stages and stays with you each day of the trip as you leave the everyday mundane duties behind. Afterwards, it continues to provide health benefits as you share your experience with family and friends. Planning travel is one of the things that I find stills reminds me of my youth. There is still process of planning, saving, preparing (reading books about the destination or doing on- line research) and the anticipation commences long before the journey begins. I know this to be true from personal experiences. SSSH! It’s a surprise! For years now my husband, Steve and I have talked about travelling to ______, but something always seems to get in the way. However, this year we are going. 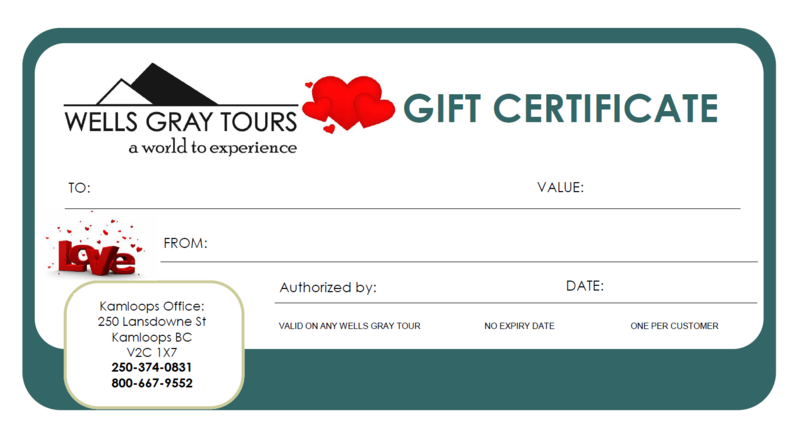 I have booked a trip with Wells Gray Tours as a surprise for Steve’s birthday. I have filled a suitcase with 30 clues, one clue for each of the days from his birthday to our departure. I have enjoyed planning the clues and anticipating his guesses which will be lots of fun for both of us as he tries to figure out where we are going. Are you looking for a way to surprise a special someone in your life for their birthday anniversary or Christmas? Why not give the gift of travel? 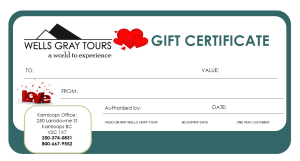 Whether you choose to select a tour or buy a travel gift certificate, you can have lots of fun creating excitement and anticipation around your gift. Familiarization Tours – What are they?